Oil and gas development is leading to an increase in groundwater usage across West Texas. And in northeast Culberson County, over 2,000 square miles of rural land lie outside of the region’s groundwater conservation district. That’s why the group is proposing to expand its jurisdiction — and meter water pumping across the entire county. According to General Manager Summer Webb, in the past, groundwater usage in the area has been primarily for domestic and agricultural purposes. And while increased oil and gas activity has led the state to issue more water well permits locally, the total amount being pumped in the northeastern half of the county is going unmonitored. “Right now without a groundwater district being in that area, there isn’t the type of record keeping that a district would normally do,” says Webb. 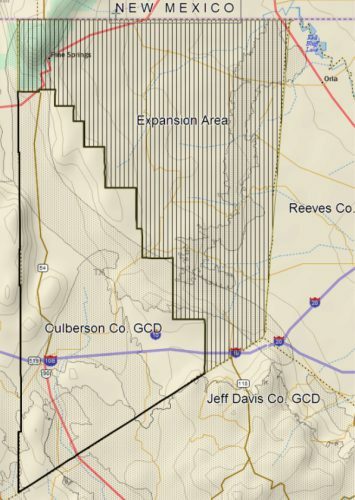 Expanding the Culberson County Groundwater Conservation District’s boundary to include the entire county would allow the district to better monitor local aquifers, and study any potential impacts that increased pumping may be having on their health. The conservation district will work with state lawmakers to bring the boundary change proposal to the 2019 Legislative Session. This entry was posted in KRTS News and tagged 2019 Legislative Session, Culberson County, culberson county groundwater conservation district, Groundwater. Bookmark the permalink.